At some point after leaving Kigali for a few months, I returned to see that Heaven seems to have expanded to take over most of KN29 Street. Signs had popped up advertising two new hotels with the same familiar Heaven acacia tree logo, plus another plot was under construction next to the restaurant. I asked Alissa what they had in store and was told that they were working on a high-end property to be called The Retreat and that the other two hotel properties (along with the three rooms already at their restaurant) were collectively known as Heaven Boutique Hotel. Heaven Boutique Hotel was confusing to me at first since each of the three properties are called different things. Up at the top of the road is the Heaven Garden Chalet, then you have the three on-site rooms at Heaven Restaurant, and then right down at the bottom of the street is their third annex called Heaven Villa. Collectively, the three are called Heaven Boutique Hotel and, in total, there are 22 rooms. It’s all clear now that I’ve had it explained to me, but I was confused for awhile there. Have a look at their website for an explanation of each of the room types at each of the properties. 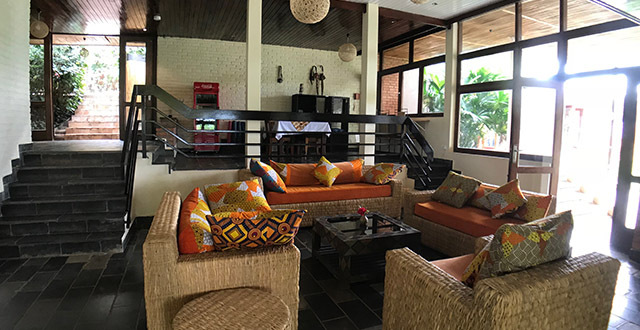 The property is one of the best options in Kigali for a hotel that includes breakfast in the $115 to $165 price range (with occasional discounts so be sure to check their website). For my overnight stay, I was at Heaven Garden Chalet located at the top of the street with seven rooms in total. This is where their beautiful gym and pool are located and I think it’s the nicest of the properties. The building is a converted home set on a beautiful piece of lush property that has been nicely landscaped and set back from the quiet road. You can barely see the building because much of the property is covered in gorgeous plants and I really loved the feeling of being surrounded by nature in the middle of Kigali. The best part about staying at the Garden Chalet is that the pool and the gym are only steps away. The pool is small, but it has some comfy lounge chairs and is nicely secluded. Plus it’s possibly the only heated, saltwater pool in Kigali (along with the pool next door at The Retreat) which is nice for a change from the typical freezing pools found elsewhere. The gym is also unique in that the front wall opens up completely to give you the feeling of working out outdoors. There’s even a grassy area if you want to feel the grass beneath your toes as you stretch! The gym is brand new with modern machines and, though it’s small, it’s very well-stocked. The gym and pool are both open to the public for Rwf 10,000 per day, Rwf 100,000 per month, or Rwf 550,000 per year (memberships gets you a 15% discount on meals at Heaven Restaurant). The Chalet also hosts a couple yoga classes and Zumba each week for Rwf 5,000 per class. My room at Heaven Garden Chalet was perfect for me. It’s one of the rooms tucked around to the left side of the building and, because of where the windows are and all of the plants, the room is darker than the ones found on the front of the building. It was perfect for me and I had the most amazing sleep! Plus I also spent some time in the room working and the quiet room combined with the desk space and excellent internet meant that I got lots of work done. If you’d like something a bit more bright then ask for one of the rooms at the front, but I was perfectly happy tucked off to the side. 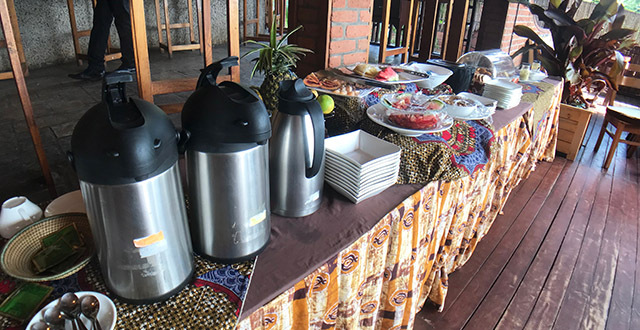 The three on-site rooms located at Heaven Restaurant are similar in style to those at the Chalet but they’re located right next to their popular restaurant, in the same compound, which makes it very handy for breakfast each morning. Two of the rooms here are family rooms with a king and a double bed which makes it a great choice if you’re travelling with kids (or even colleagues or friends travelling together). There’s even a pretty substantial kid’s playground in the compound which is another great addition for young families. As an added bonus, there’s also an art gallery and the Azizi Life Boutique on site which makes buying some high quality and unique souvenirs super easy. The rooms at Heaven Villa are just as nice as the others, but the property is my least favourite of the bunch. It’s still a great option when you compare it to other hotels around Kigali for a similar price, especially for the queen rooms which are great for those on a budget. But out of the three locations of the Heaven Boutique Hotel this one is my least favourite just because the other two locations have so much character. The rooms are just as good and each one actually even has its own private balcony, but there’s no garden and the gym and pool are a bit of a trek up to the top of the road. Again, it’s a wonderful option compared to other places in the city, but if you’re planning a stay at Heaven Boutique Hotel, I would try to get a room at the Chalet first and then one of the on-site rooms as a second choice. If the Villa is the only space available, it’s still much better than other options in the city so go for it, but I really loved the Chalet a lot and I would recommend you try for a room there first. One of the main reasons to stay at Heaven Boutique Hotel is that it’s owned and managed by Heaven Restaurant who serve up a delicious breakfast each morning. I was impressed by the cold buffet of delicious muesli, yoghurt, bread, and fruit along with coffee and tea. I was really impressed that there was also a choice for a hot meal which makes a stay here even better value. 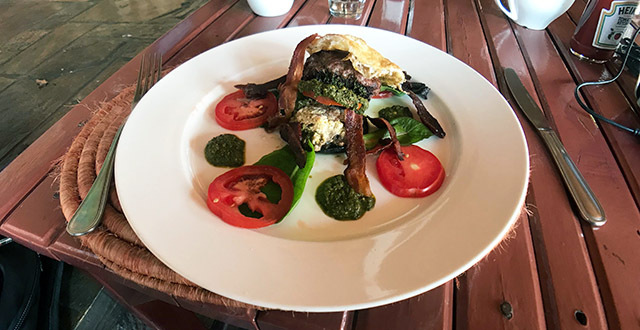 Everything looked amazing but I opted for an intriguing bun-less burger served on a Portobello mushroom served with bacon, a green salsa, fried tomato, and topped with an egg. All of the staff I met during my stay at Heaven Boutique Hotel were very friendly, everything went as planned without any problems or surprises, I had a wonderful night’s sleep, the hot water and water pressure were great, the breakfast was amazing, and having access to a pool and gym is a great bonus. 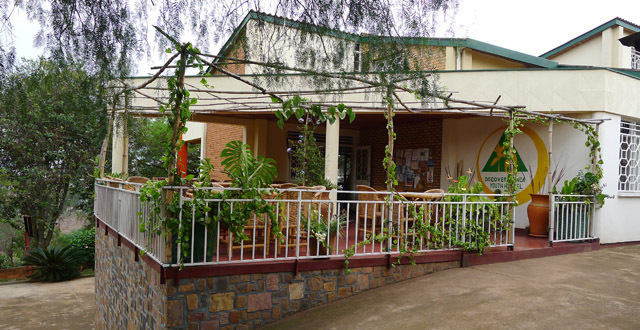 Plus the hotel feels like it’s more of a personal place to stay when compared to a lot of soulless accommodation in the same price range around Kigali. If you like a place that makes you feel like you’re at home then it’s a great choice. The owners are often around, the manager is always happy to help, and the vibe of the place is really nice. 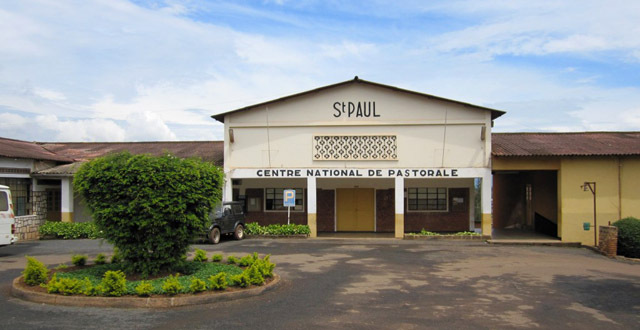 I live in Kigali so I haven’t had much of an opportunity to stay in too many hotels in the city, but I have been in a few here and there for meals or just for a look around. I really think Heaven Boutique Hotel is a great choice and, with the great breakfast that’s included and the wonderful location, it’s very good value also. Check them out the next time you pass through Kigali! Prices were correct when I published this article but call to confirm or check the booking page of their website.